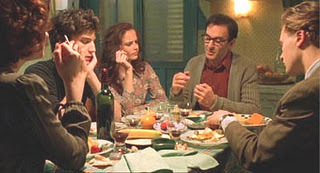 Bernardo Bertolucci’s The Dreamers (2003) might well be the benchmark of Occupy Nowhere’s genre make up. It sensually explores the cloistered lives of three cinephilic young adults – twins Theo (Louis Garrel) and Isabelle (Eva Green), and their friend Matthew (Michael Pitt) – as Paris verges into social upheaval after the forced deposition of Henri Langlois as head of the film mecca that was the Cinematheque Francaise. In it, director Bertolucci furthers his thesis on existential isolationism begun with Last Tango in Paris (1972) and The Last Emperor (1987). The Dreamers unfolds during the famed May ’68 uprisings. Bertolucci uses that historical material not as academia to be exposited, but as a source of brewing intensity rendered peripherally. The film is insularly about the three main characters’ shifting perceptions of “self,” their construction of a personal language, and the forging of a shared emotional identity over a month of self-imposed house arrest. Various degrees of intimately waged war and stagnation that occur within the closed-off apartment – termed the Quartier des Enfants in the source novel – are reflected by publicly waged war (riots) and stagnation (uncollected trash, debris). Gilbert Adair, author of the novel and screenplay, explains in his DVD commentary that the telling of the story and the making of the film holds no implicit irony, but now, seven years later amid a global society of dreamers waking from a complacent daze, occupying the public arena in protest, a relevance to that history is drawn by the event of watching. 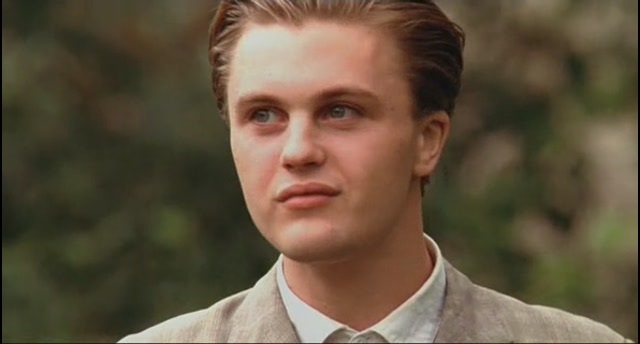 Timid but ponderous Matthew, brimming from the first shot with boyish enthusiasm and naiveté, is an American student studying French in Paris. But as he suggests in voice-over-narration, his real education is earned at the Cinematheque Francaise. Matthew meets Theo and Isa during an inclement day of protest against that institution’s closing, and thinks himself in love. Matthew has dinner with the siblings and their parents the next evening at their flat. The father is a somewhat distracted thinker, apparently renown for his poetry. The mother is a sympathetic but utterly strong-willed woman whose domesticity never appears like submission. During the intimate meal, Matthew shares a rather implicating dialogue with the father… implicating in what it predicts about the nature of Matthew’s own impending role in the twins’ binary orbit. Amid the father’s monologue about the spontaneous nature of inspiration, Matthew fidgets with Isabelle’s tin lighter, not paying attention. When the father calls him out on his behavior, Matthew apologetically explains the discovery he’s made in the course of his brief distraction. Upon placing the lighter on the table he noticed that the lighter’s length is exactly that of the diagonal of the plaid pattern of the tablecloth, and that further investigation revealed that every other measurement (height, width, depth) of the lighter is equal to some dimension of the same pattern. Matthew demonstrates all the places and configurations it fits into; between two plates, the length between the knuckles on Isa’s ring finger, etc. “I was noticing that the more you look at everything; this table, the objects on it, the refrigerator, this room, your nose…the world, suddenly you realize that there’s some kind of cosmic harmony of shapes and sizes. I was just wondering why? I don’t know why that is… I know that it is,” he says in a self-consciously ponderous tone. Matthew has this revelation, not outside, but at a cramped and dimly lit dinner table in a small kitchen by simple accident, and thereby illustrates the father’s point of spontaneous inspiration perfectly. After dinner Theo and Isa invite Matthew to stay with them for the subsequent month of their parents’ absence, and in that time he assumes the role of observer – not from above or outside, but from within. During these almost mythical weeks, Matthew slowly realizes his objectivity in the palpable claustrophobia of the twin’s stunted evolution and the winding unkempt flat, much like the claustrophobic dinner table where all the details came together first. In their time apart from the broader goings on of May ‘68, the twins include Matthew (as somewhat of a play-thing) in their private film-derived language, and use it to further dismantle reality and one another. The game of it evolves more deeply from his participation. Without a cinematheque, Theo Isa and Matthew impersonate films from the reels imprinted in their cinephilic minds. Sometimes it is mere sport – for which wrong guesses are punished with sexual hazing – and sometimes it is integrated into their person as bodily as a mother tongue. In the same way, Bertolucci grafts the scenes being evoked by the characters into the very skin of his film, which is its own kind of penetrative act. For the three dreamers and for Bertolucci, the prism of cinema – itself a screening from and framing of reality – is the only means through which they can understand or accept that reality. Matthew – the sexual, ideological, critical, spatial, emotional penetrator of this world, sees and understands this. This is such a fragile architecture though. Just as the airlessness of a film-watching experience can be shattered by a cough, a phone, a lobby door opening and allowing sounds and light to filter in, so too the sanctity of the quartier des enfants can be ruptured buy the persistence of reality from without. The formative course of their alienation too gives rise to the very contradictions, plateaus, oversaturation, analysis, and redundancies that dissolve the seeming perfection of that exile. That’s what makes the story so rich. Through their total love of film and their cannibalistic use of it as part of their identities, it becomes clear that Theo Isa and even Matthew had “occupied nowhere” long before they sealed themselves off in the quartier des enfants.